When Derry was designated the UK City of Culture 2013, the fact that funding would be available for various artistic projects was an opportunity too good to be missed. 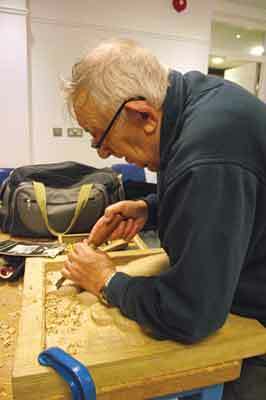 Woodcarving tutor Liam Kennedy put the proposition to Eden Place Arts Centre leader Judi Logue, who jumped at the idea. The project was left to Liam while Judi secured the funding. 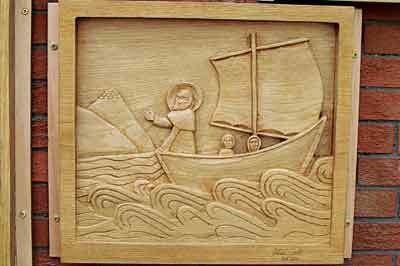 Initial meetings were held with enthusiastic woodcarving class members and ideas suggested until it was agreed to produce carvings based on the life of Saint Colmcille, the patron saint of Derry. With the subject matter agreed on, research was carried out, resources pooled and ideas developed. 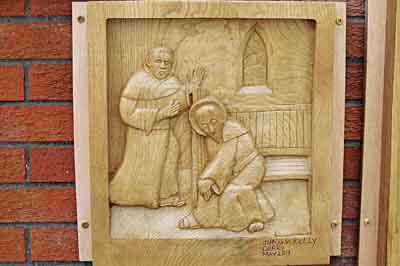 Rosaleen O'Callaghan took on much of the research and identified nine areas of the saint's life worth highlighting. 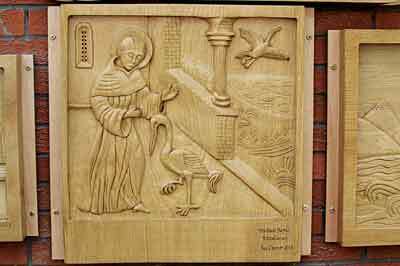 Pictures were sourced to match this storyline but some needed modification, so local artist Maire Mullan improved the existing pictures and produced additional drawings to complete the set. 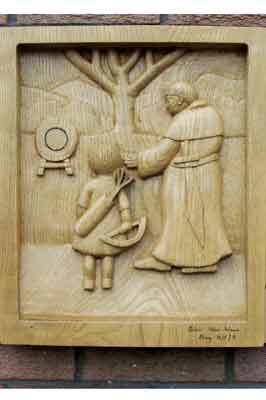 Oak (Quercus robur) is synonymous with Derry. 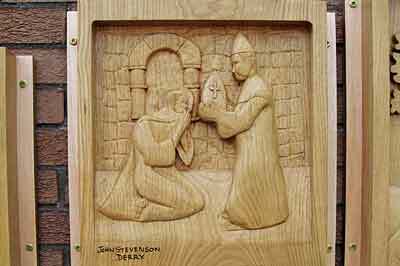 The Irish word for Derry is 'Doire', which means oak grove. Unfortunately, oak of the required size was not available locally, so sweet chestnut (Castanea sativa) was chosen as a suitable alternative. 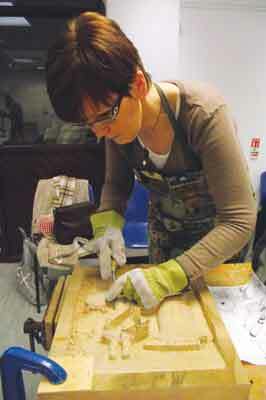 Once the wood was cut to size and prepared, the project was up and running. 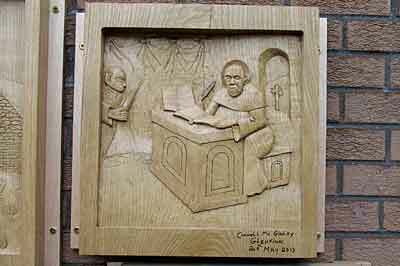 Rather than cut across the weekly classes at the centre, most of the work was done by the carvers at their homes, with regular 'check-in' sessions to make sure progress was constant. 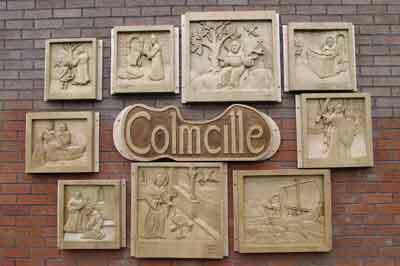 The carvings were completed by mid-May, in time for the Colmcille Festival on 7-8 June. 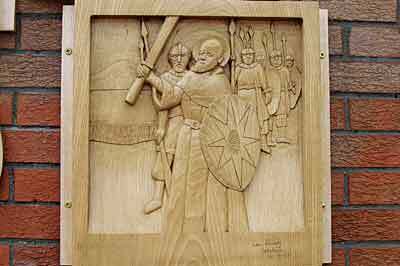 They were secured to the gable wall of the centre's exhibition hall and were unveiled by the Mayor of Derry at the start of the Festival. 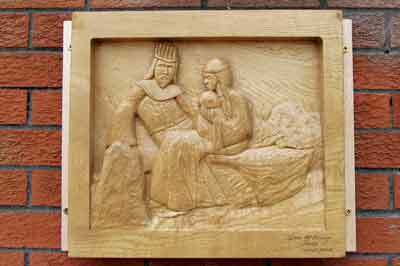 The carvings are now a permanent attraction on the Derry Tourist Route. 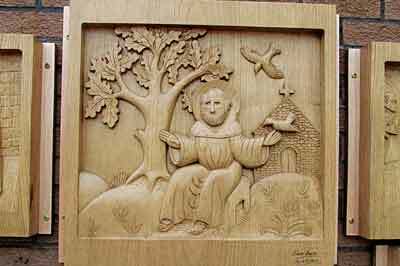 Credit has to be paid to the carvers who embraced the project so enthusiastically, some were pushed out of their comfort zones and responded with distinction. 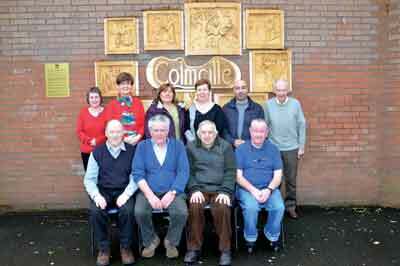 The carvers involved were Jimmy Smyth, Aileen MacManus, Connell McGinley, Helen Shiels, Masoud Baghi, Johanna Kelly, John Stevenson, Desi McKinney and tutor Liam Kennedy.